Jacqueline A. Potter, 76, of New Haven, entered eternal rest on November 11, 2018. She was the beloved wife of Matthew Potter. Mrs. Potter was born in New Haven, CT on May 10, 1942, a daughter of the late Robert and Minnie Lou Taylor. 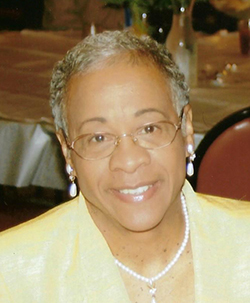 Prior to retiring, she was employed at Yale-New Haven Hospital as a Registered Nurse. Jacqueline was a founding member of Agape Christian Center and at the time of her passing, was a member of Strong Tower Pentecostal Ministries where she was an ordained minister. In addition to her husband, she leaves to cherish loving memories, sons, Darrick Potter, Sr. (Sonia), Kyle Potter (Celeste) and Von Potter (Rachel); brothers, Howard, Anthony and Robert Taylor; sisters, Sharon Winfrey and Cheryl Brown; five grandchildren, Darrick, Jr., Joseph, Jada, Raven and Laila Potter; and a host of other relatives and friends. She was preceded in death by a brother, Melvin Taylor. A celebration of Mrs. Potter’s life and legacy will be held Tuesday, November 20, 2018 at 11:00 a.m. at Trinity Temple Church of God in Christ, 285 Dixwell Ave., New Haven. Viewing will be held at the church from 10:00-11:00 a.m. Burial will be in Beaverdale Memorial Park. Potter,I am very sorry to hear about the passing of your wife.You and your family have my deepest sympathy during your time of grief.. Right now, when your loss is so fresh, it may be difficult for you to imagine that this pain will ever go away. But in time the blessing of God’s unfailing love will soften the hurt you’re feeling and bring your heart the peace, comfort and hope that it needs to heal. Our lovjng heavenly father promises to be their for us (2 corinthians 1:3,4). I am very sorry for your loss. Please accept my sincere condolences. I pray that the Lord Almighty will comfort you and the entire family at this time. Earth has no sorrow that heaven can’t heal. My thoughts and prayers go out to each of you. May He lift the burden of your pain and loss. God bless and be with you.